​CAN I REGISTER TO RUN/WALK AT THE EVENT? Yes, walk-up registrations are available starting at 7am. You can also register at Early Packet Pick-up on Friday, November 17th, from 3:30pm to 7:00pm at ASK’s office located at 5211 West Broad Street, Suite 102, Richmond, VA. 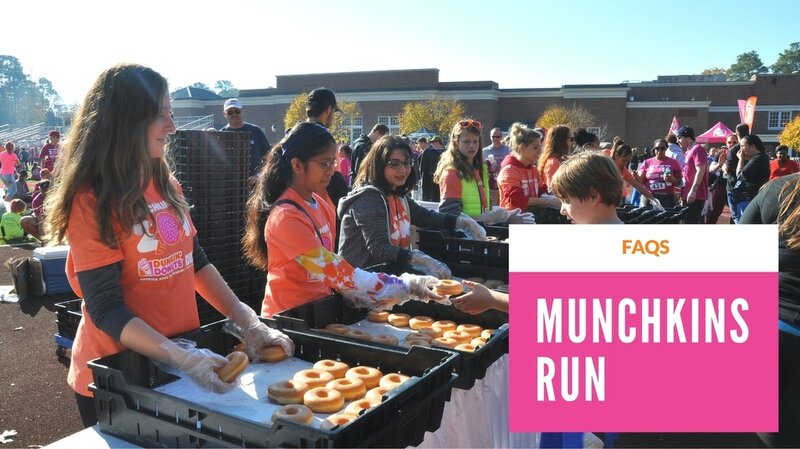 Your walk/run registration includes a t-shirt, finisher medal, Dunkin' Donuts finisher's breakfast with coupons for more Dunkin' treats. Because you receive these awesome goodies in return, your registration is not tax deductible but donations are! All kids aged 6 or older must register to take part in the 5K. They will receive a bib number, t-shirt and medal. Kids aged 5 or below can register for the Kids Donut Dash where they will receive a bib number and medal, and can join you afterwards on the 5K course. Registered runners and walkers will have timing chips. Results will be posted on this site as soon as possible after the event. A timing clock will also be in view at the start and finish lines. We are sorry but we do not offer refunds. If you are unable to participate, you are entitled to pick up your t-shirt and goody bag at early packet pick-up. We’re also happy to convert your registration to a donation. Contact Jen Stiles at jstiles@askccf.org or call the office at 804-658-5910. All donations directly benefit ASK Childhood Cancer Foundation, a 501c3 nonprofit organization. Contributions are tax-deductible to the extent allowed. A receipt will be automatically emailed you if making your gift online. If you need a copy of your receipt, email us at jstiles@askccf.org or call 804-658-5910. Please do! Through “Edit my Fundraiser” tab you can upload a photo and tell your own story about why ASK is important to you, how it touches your heart, and why it matters. Reach out to everyone you know to ask them for their help in reaching your goal! WHERE DO I PARK? WHERE IS REGISTRATION? WHERE IS THE STARTING LINE? Don't worry, we have your questions covered with our Parking Map and Course Map. Everything takes place around the St. Christopher's football field and track. You can't miss it! IS THERE EARLY PACKET PICKUP? Yes, Early Packet Pickup will be on Friday, November 17th, from 3:30pm to 7:00pm at ASK’s office located at 5211 W. Broad Street, Suite 102, Richmond, VA. Our front door is actually located on the backside of the building. CAN I PICK UP PACKETS FOR MY ENTIRE TEAM? Yes, you can pick-up your team's packets during Early Packet Pick-Up. Just give us a call at 804-658-5910 an hour in advance of picking up and we'll have everything ready for you. Yes, you can pick-up your friend's packet. Just make sure they know you're picking up for them. CAN I REGISTER TO RUN/WALK AFTER ONLINE REGISTRATION CLOSES? CAN I PICK UP MY PACKET AT THE RACE? Yes, packet pickup is available starting at 7am. Be sure to give yourself time to park, pickup and get to the starting line by 9am (or 8am if participating in the Kids Donut Dash). Certainly! Just stop by the pledge table near Registration and we’ll take care of it. Thank you! Of course! Water stops will be located at mile markers one and two as well as the finish line. There are munchkins along the course with water stops at Mile 1 and Mile 2. A big Dunkin' Donuts finish line breakfast awaits you along with coffee, hot chocolate, granola bars and bananas. Yes! We ask that if you're participating in the race to please line up behind the runners at the start line. Probably best to leave Fido at home as there will be a lot of people , kids, and even giant walking coffees at the event.